My family was blessed with a new addition a few weeks ago! 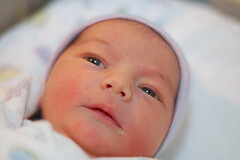 Here is a photo of my son while we were still at the hospital. Mom, older brother, and baby are all doing fine, though my wife and I (yes, yes, I know, much worse for my wife) have had much less sleep than normal! It's been a bit of a bummer timing-wise since I've had to miss CDNLive! and the Accellera VIP face to face, but my wife wasn't very helpful when I asked if she could move in the schedule a bit ;-). I finally arrived back in Austin late Sunday evening after spending last week in Nice at DATE. Over the weekend, I had the opportunity to visit my friend Alisa, who I've known since junior high, and her family about an hour outside of Paris. A description of my weekend along with photos would have made for a great blog post, but as luck would have it, Alisa has done all of the work for me and written up a description of the weekend on her blog! I had a great time visiting - it's always a real treat to get to spend time in a foreign country outside of the standard tourist destinations, and with such great hosts in such a relaxing location it would have been difficult to plan a better ending to my trip to France. Who Puts the 'Cool' in Cool Verification? Ok, many of you have commented that my picture on Cool Verification looks nothing like me. I'm not sure I understand... all I'm missing these days is a hat, sunglasses, and a beard... nothing that should make me look that different! Take a look for yourself. 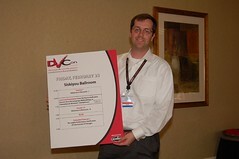 Here I am hanging out in the hallway of the DoubleTree hotel here in San Jose holding one of the conference signs (with a stern looking woman in a nearby chair giving Joe Hupcey and I an evil eye). I didn't know Joe was a photography expert, but once I found out I was quick to ask him to help me take this shot. Thanks Joe! We're coming up on the end of the conference. The best paper announcement is in just about 20 minutes or so. I'll be posting that live as soon as it is announced. I've also got a huge stack of notes from the Mentor Graphics coverage panel this morning ("Blended Coverage: A Recipe for Success"), the Cadence lunch panel (" Does the Key to Verification Success Lie in the Language, Methodology, or Somewhere In-Between? "), and and from my interview with Mike Stellfox. Both of the panels today were excellent. Kudos to Harry Foster and Mike Stellfox for putting together such interesting groups of people. I'm aware that from time to time some of you may venture past the confines of my blog over to the Verilab website (good for you!). Once you get there, you may find yourself a bit underwhelmed. Turns out, though we occasionally post new papers in the "downloads" section of the site, the site in general has suffered from a lack of TLC of late. Since August, we've been working on remedying that, with a lot of effort having started just recently to develop content for a new and improved site, to be released within the next few months. As part of that effort, I've been trying to come up with a compelling "Day in the Life" type story to add to the "Careers" section of the site. I've had my share of interesting days working for Verilab, but as I started a trip down memory lane I realized that the most interesting part of my experience at Verilab isn't what happened to me on any one day, but instead, what I've learned while I've been here. So, on that note, I thought I'd share with you a (somewhat incomplete) list of the interesting things I've learned while working at Verilab. Ok, I'm a little late in sharing this, but hopefully regular readers of Cool Verification will find this as humorous as I do. Back in November I noticed a huge spike in hits to an obscure post in my blog about lunchables entitled I Hate Lunchables. If you do a Google search on "lunchables" you'll find that post shows up as the 12th result (as of today anyways). Turns out Jennifer McCann, author of the book "Vegan Lunch Box" and a blog of the same name decided to use my description of lunchables as an intro into her vegetarian recipe for a similar dish. As expected, when people from the Vegan Lunch Box blog visit my site, they don't browse around much past that particular article :-). Update December 11, 2006 - Fixed link to Doug's Easy Button Mod. Those of you in the US are probably familiar with the office supply store Staples, and the recent advertisements using the "Easy Button". My brother Doug has always enjoyed working on unusual projects in his spare time. Apparently, he's got just a little too much spare time on his hands these days. His most recent project? Modifying the "Easy Button" - either the easy way or the hard way. Check it out! Update July 5, 2006 - Fixed a small typo. As our son gets older and a bit more mobile, it's getting to the point where we need to start thinking about childproofing the house. At first glance, I didn't figure there would be too much to do... put in some plug covers, a gate at the top of the stairs, and perhaps move some stuff a bit higher off the floor. Coincidentally, we had some friends of ours and their young kids over a couple of weeks ago. An unintended benefit (I swear, I didn't plan this!) was that the kids (2 and 4) were able to highlight some additional areas of the house that need childproofing (basically, all of them!). I'm still a bit naive about some of the finer points of raising children, which highlights the fact that it's important to really understand the end users of products you're developing. If possible, make sure you use the appropriate test subjects (in this case, someone else's children!). It's also good to test early and test often. That way, you'll catch poor design decisions and implementation flaws before they are caught by unwitting end-users. 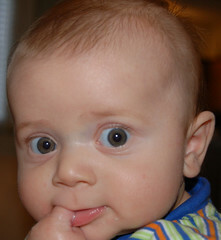 But in the end, how do I know that my friends' kids are representative of the types of trouble my own son will get into? For starters, I only got two sample points - 2 and 4 year olds. They were under constant parental supervision. I have no idea what would have happened if they'd been left to their own devices (though I'm quite certain a painting we have hanging in the living room would have changed colors, for starters). In other words, how do I know when I'm done verifying that my house is childproof? Is that even possible? Last week I wrote about some presentations and a discussion that took place at the local DV Club luncheon about verification metrics. I know many of you out there have kids, nieces, nephews, etc. 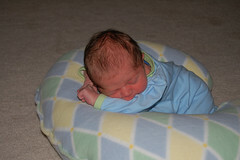 I'd love to hear suggestions on how I can utilize my verification expertise to ensure my son's safety. Either that, or perhaps some of you would like to volunteer to bring your children over to help me flush out the kinks from my (cue scary voice) "childproof house of doom"! The Gray household just got a little bit larger over the course of the past week! About the only thing better would be if I could get a little sleep every once and awhile! Diapers, slobber, and spit - lucky for him he's so cute, otherwise, he'd be on his own! :-). Have you ever had the feeling that you were standing at the edge of a cliff with someone right behind you - just waiting for the right time to push you over the edge? Or perhaps like you've been left at the top of a steep mountain with a pair of skis but you never mastered the bunny slopes (funny story about that actually... let's just say it's related to my CV photo)?